Does the space accommodate a range of activities? For example places to sit, stand, play, read or relax. Are public facilities provided for the comfort of the pedestrians? For example seats, shelters, leaning rails, wide footpaths, public toilets, and drinking fountains. Will public spaces and streets be comfortable and safe day and night? Will streets and places be well sign posted? Are public spaces designed to have adequate sunlight, shade and shelter from harsh weather conditions? For example, are there awnings to protect people from rain along commercial streets and at bus stops? Do the block and lot layouts allow sunlight to residences, public spaces and streets? Do streets and paths incorporate trees that provide adequate shade and which will improve the look and feel of the place? Will trees, plants, green roofs and green walls be used to cool the urban environment? Will vehicular movement be slowed, calmed or restricted in areas of high pedestrian activity, in order to reduce noise and pollution and improve safety? Do public places feel well maintained, clean and unpolluted? Are there publically accessible places that offer a variety of activities, and a range of seating, that are free of charge for anyone to use? Is the place welcoming for people who don’t necessarily intend to buy goods or services there? If it is privately owned space, are people able to access or use the space outside of operating hours? Will it be an affordable place to live in or visit? Will it be a place that has a sense of community, belonging and ownership for its residents or users? Will the place make you feel out of place or uncomfortable? Does the place embrace cultural diversity and difference? Have the needs of people who are frail, or have physical disabilities, been considered in the design of both public and private spaces? Are they able to readily access all, or most, areas? Does the design incorporate universal design standards? Does it cater for children of varying ages, including playground and recreation areas? Mayor of London, Children and Young People’s Strategy, 2004. 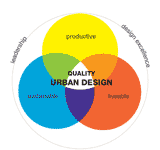 A framework providing urban design objectives and actions for safe and healthy communities (Heart Foundation of AustraliaTasmanian Division, 2011). A resource providing design considerations, evidence, tools and case studies for designing, developing and maintaining the public realm in a way that encourages active living (National Heart Foundation of Australia—Victorian Division, 2004). The lead national, not-for profit organisation for livable housing design in Australia whose primary aim is to encourage the adoption of livable housing features in all new homes being built in Australia. An international resource of information and case studies on making great public places (Project for Public Spaces). A list of principles for creating pleasant, hospitable and sustainable high-density cities and districts (Sustainable Cities Collective, 2013).